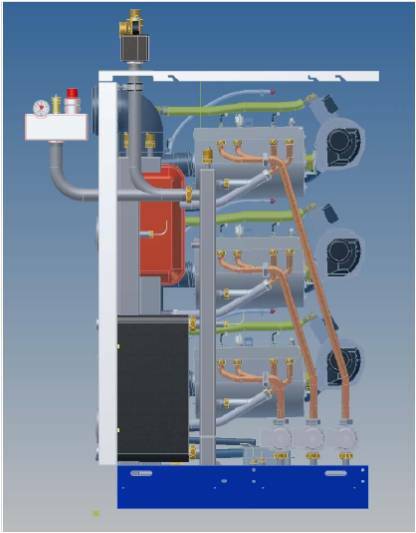 The ProCon HTP is a gas condensing boiler with internal plate heat exchanger, designed to separate the new boiler from the existing and potentially contaminated distribution system. It is suitable for use with systems with up to 10 bar operating pressures. The ProCon 150 comprises 2 x 75kW modules; the ProCon 225kW uses 3 x 75kW modules. Building upon the success of the standard ProCon HT the ProCon HTP has been developed. The application of an internal system separating plate heat exchanger allows the ProCon HTP to be applied to systems with operating pressures up to 10 bar. The ProCon HTP is equipped with all necessary pressure managing components, the only exception being a system pressure manager as required by BS6644. The integral RVS cascade controller can control up to 15 burner modules (5 x HTP 225 = 15 x 75kW modules = 1,125kW output) providing seamless turndown up to 75:1. The ProCon HTP 150 comprises of 2 x 75kW modules, whereas the ProCon HTP 225 comprises of 3 x 75kW modules. Full BMS intigration is also possible with the application of module communication clips. Seasonal Efficiency Calculations Data Sheet, PDF Download.